A fall version of everyone’s favorite salad! 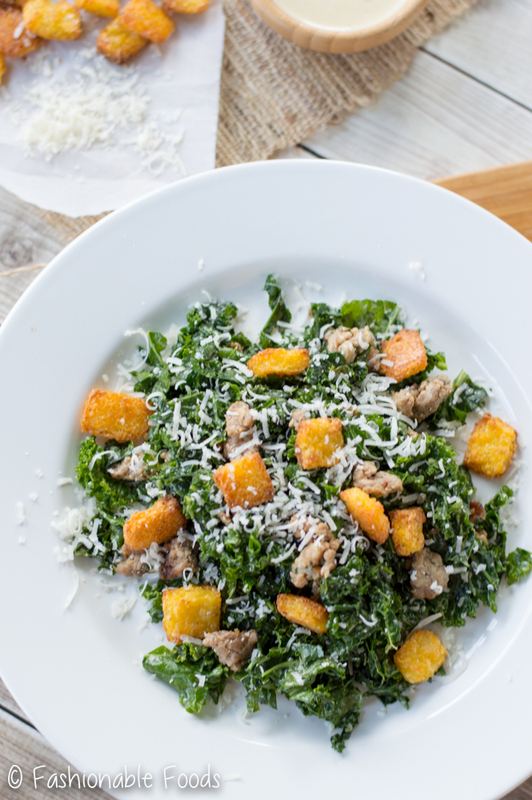 This kale Caesar salad is topped with polenta croutons and sausage – it’s even better than the original! Happy Monday! 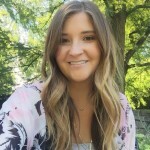 I can say that because it’s currently Sunday as I write this… so even though it’s probably not a happy Monday, I’m happy because it’s still Sunday for me. Make sense? Did you all have a nice weekend? Mine wasn’t that eventful because I’m taking way too long to remember what I did ?. Please tell me I’m not the only one struggling to remember what they did?! I’m just having trouble focusing on anything but this fabulous kale caesar salad. With polenta croutons. And sausage. Yes, it’s just as good as it sounds! If salads could be considered comfort food, this one would totally make the list. It’s creamy, crunchy, tangy, cheesy, and fresh. And of course, super delicious! I’ve mentioned before that I like my salads with flavorful greens over lettuce. I’ll take kale or arugula salads over romaine or iceberg any day. Plus, kale is everywhere and extra tasty in the fall months. It also lasts a while in the fridge, even with dressing on it! So, you can make this ahead (but keep the croutons separate so they stay crunchy) and enjoy it all week long for lunch. 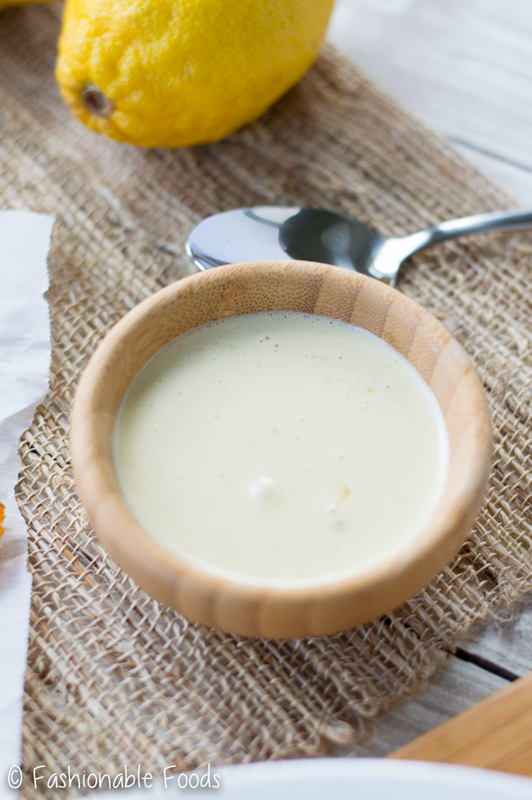 If you’ve never made your own caesar dressing, you are in for a treat! It’s really simple and once you taste it, you’ll never want store-bought again. If you’re squeamish about eggs and anchovies, then move along. Just kidding! Well, I’m not really kidding. Caesar dressing isn’t caesar dressing without those 2 main components. The good news is, if you’ve purchased a really good caesar dressing in the store or had it at a restaurant, you’ve eaten anchovies. I personally love anchovies – they add such an amazing salty flavor to a multitude of things. Especially caesar dressing! 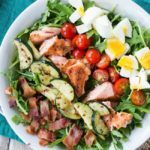 The dressing is essentially like making homemade mayonnaise – the eggs and oil emulsify to make that thick, creamy dressing we all know and love. Garlic, anchovies, lemon, dijon mustard, worcestershire sauce, and parmesan cheese provide all the flavor. 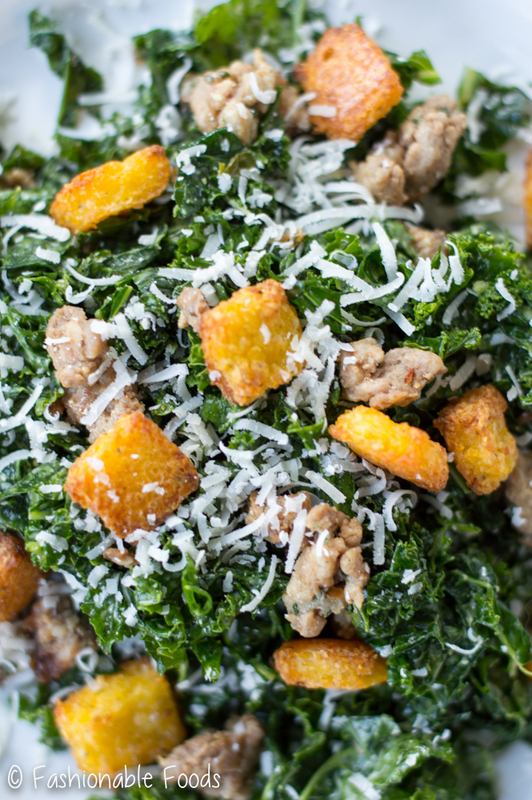 My favorite thing about this salad (next to the dressing) is the polenta croutons. Naturally gluten-free and insanely delicious! I made my own polenta, let it cool in the fridge, and then cut it up into crouton-sized pieces and bake until crispy. To speed this process up, you can very easily buy some prepared polenta from the grocery store. Either way you’ll have some tasty croutons! To make this a little heartier and Kyle-friendly, I added sausage. If you aren’t into sausage, chicken or shrimp would be tasty too! 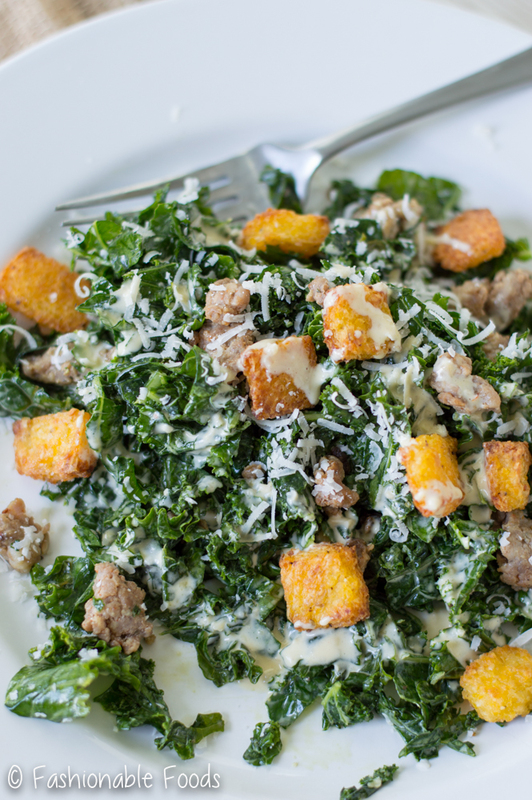 If you love a traditional caesar salad and kale salads, you’re really going to love this one! 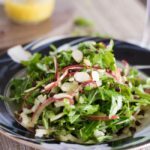 It’s the perfect salad for fall and would also make a great addition to your Thanksgiving meal. Yep, it’s getting to be that time where we need to start thinking about Thanksgiving! A fall version of everyone’s favorite salad! 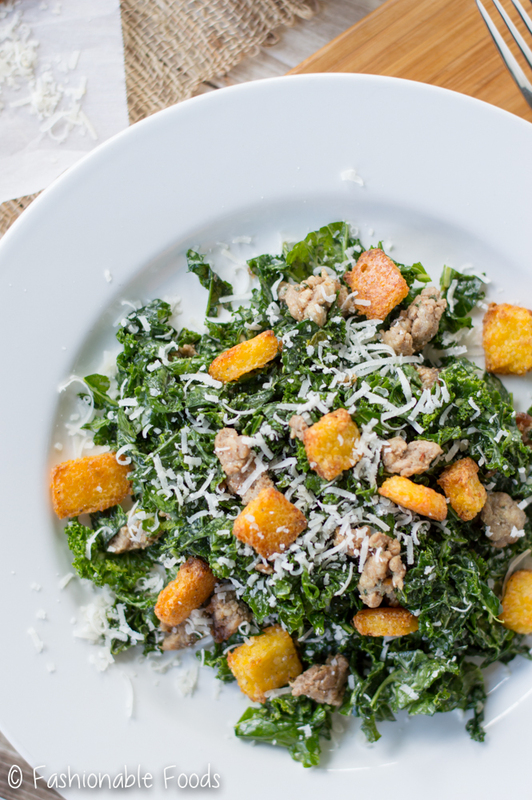 This kale Caesar salad is topped with polenta croutons and sausage - even better than the original! Bring the water to a boil a medium pot. Slowly whisk in the cornmeal, switch to a wooden spoon and continue stirring until the mixture thickens. Cook the polenta, stirring often, for about 20-25 minutes. The polenta will be thick and when you taste it, it will be tender and not bitter. Stir in the butter, parmesan cheese, and season with salt and pepper. Spread the polenta in a small rectangle pan or container – you want the thickness to be that of a slice of bread. Refrigerate the polenta for at least 2 hours, but the longer the better. You want it to be firm and easy to cut. 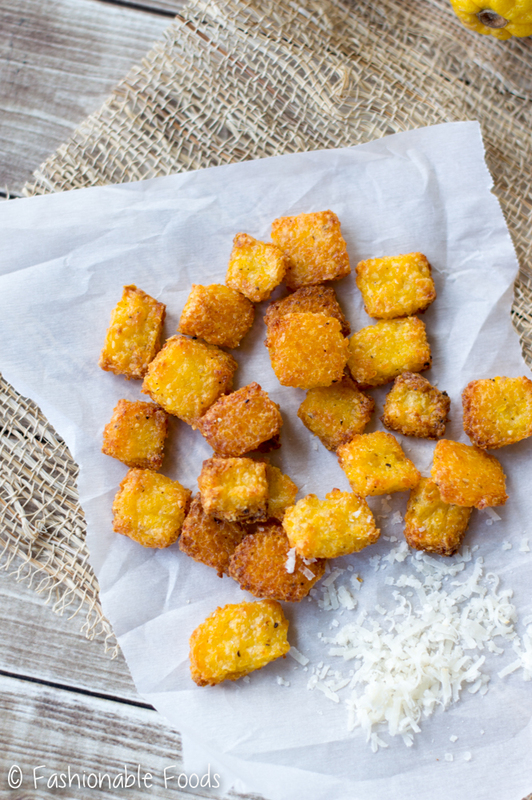 Cut the polenta in crouton sized pieces and lay them out evenly on silicone, parchment, or foil lined baking sheet. Drizzle very lightly with olive oil and bake the croutons for 10-15 minutes, or until the bottoms are brown. Flip the croutons and bake for an additional 10 minutes, or until evenly browned and crisp. Let cool completely. To make the dressing, combine the egg yolk, anchovies, garlic, Dijon, lemon juice, and Worcestershire in a mini food processor or blender. Pulse to break everything up and then slowly begin drizzling in the extra-light olive oil. The dressing should be thick and emulsified. Transfer it to a bowl and whisk in the extra-virgin olive oil and parmesan cheese. Taste and season the dressing with salt and pepper. Assemble the salad by first massaging the kale until it wilts down slightly and takes on an almost cooked appearance. 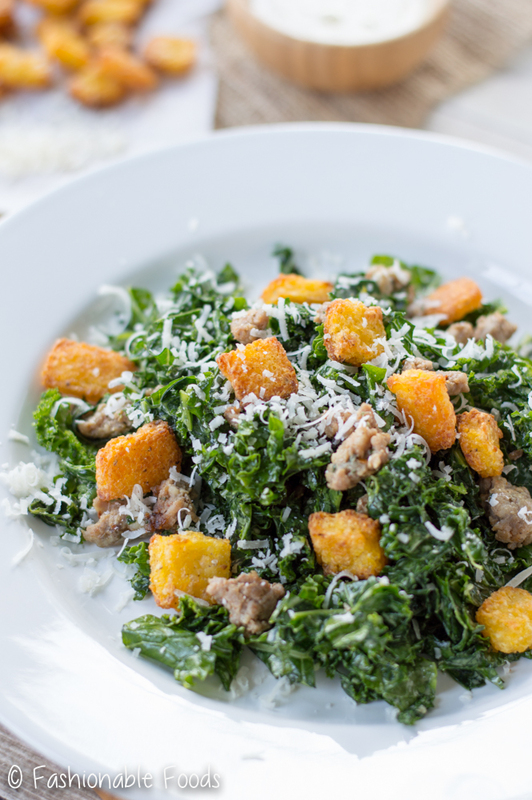 Toss with a few tablespoons of the dressing and then toss in the sausage and croutons. Pile the salad on serving plates and top with additional dressing and parmesan cheese. Serve and enjoy! To save time, you can purchase store-bought polenta instead of making your own. *Make sure the Worcestershire sauce you purchase is gluten-free if you need this recipe to be gluten-free! *The 2 types of olive oil are necessary for this recipe - the extra-light olive oil helps avoid a bitter taste that extra-virgin can develop during an emulsification. By whisking it in after the dressing is emulsified with light oil, you get the rich flavor of the extra-virgin without the bitterness. Mmm this caesar salad is calling my name! I had a similar version about a year ago and have been hooked ever since. And those croutons! YUM! 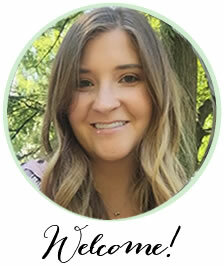 This looks like the perfect lunch, Keri! Thanks Gayle! 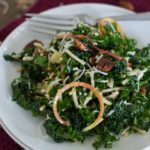 It’s my new favorite salad – I can’t get enough! Hmmmm… I can’t really recall what I did over the weekend either, so your not alone! Although it is now Wednesday… but that’s not really an excuse! 😉 Anyways, YAHHHHSSSS to this salad Keri!!! Seriously, this is a caesar salad with class!!! 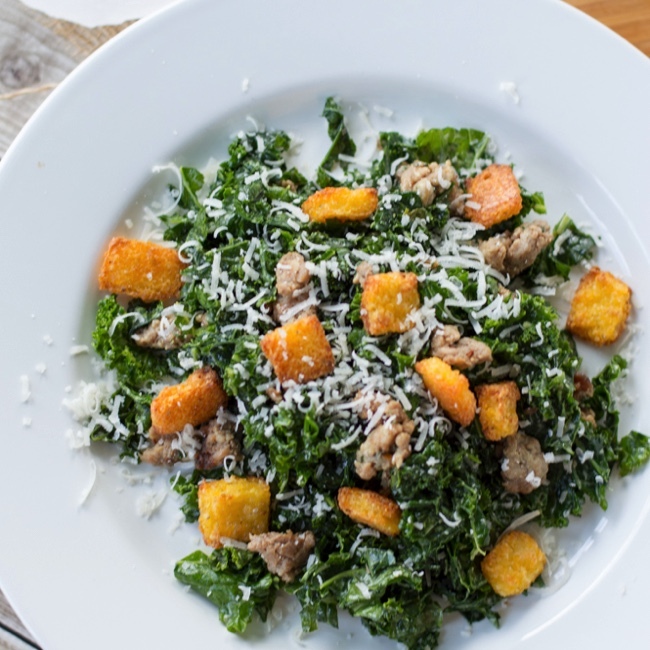 LOVE that you used kale and those polenta croutons are FAB! Plus who doesn’t love some sausage!! I am totally making this soon! Pinned! Cheers, friend!